Home | Introduction | Gondwanan Relicts | "Lemurian Stepping Stones"
Paleomagnetic data from the western Indian Ocean has firmly established the paleogeographic history of Madagascar (Rabinowitz et al. 1983). Figure 1 depicts a schematic representation of Gondwanan land masses from the time Madagascar arrived at its current position 121 MYA until the separation of Greater India from Madagascar 88 MYA (Storey et al. 1995), by which time the break-up of virtually all of the individual Gondwanan land masses had begun. 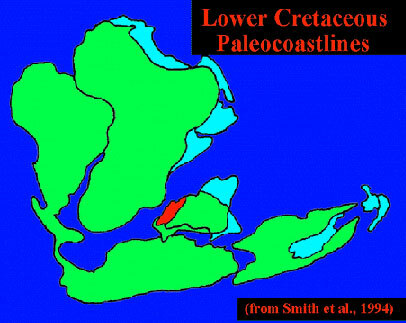 Throughout the period rifting was occurring both between Africa/South America and Greater India/Antarctica, although each pair remained within close proximity through the end of the Cretaceous/early Tertiary. By 80 MYA, direct land routes between New Zealand and New Caledonia and Antarctica/Australia had been severed (Mildenhall 1980); very slow rifting between Australia/New Guinea and Antarctica had also begun, but New Guinea did not emerge above sea level until the late Eocene at which time Gondwanan elements first entered (Axelrod & Raven 1982). A dispersal pathway through Antarctica to South America remained possible until the close of the Eocene (Raven 1979). Figure 1. Schematic representation of Gondwanan land masses during initial Cretaceous radiation of the angiosperms, between the time of arrival of Madagascar at its present position (121 MYA) and the time of separation of Greater India from Madagascar (88 MYA). Throughout the time period, rifting is occurring between both Africa/South America and Greater India/Antarctica, although each pair remains within close proximity at the end of the period. India is also shown (broken border) after collision with Asia (45 MYA), at which point a direct link with W. Malesia is established. Abreviations: MADAG = Madagascar; N.C. = New Caledonia; N.G. = New Guinea (submerged until late Eocene); N.Z. = New Zealand. The time period spanned in Figure 1 is also contemporaneous with the initial radiation of the angiosperms. Insofar as Madagascar began to separate from Africa during the late Jurassic (165 MYA), it is probable that angiosperms were not present on the island during most of its slow rafting to its current position. Paleobotanical data from Madagascar at this critical time period are scant. Palynomorphs from mid-Cretaceous (middle Albian to late Cenomanian) samples near Antsiranana belong to the Gondwana microfloral Province, dominated by bisaccate gymnosperms and ferns, but are lacking angiosperms (Herngreen et al. 1982). Another Cenomanian assemblage from Ankanotra is dominated by the conifer Classopollis; however, six different angiosperm pollen types are present. Despite the lack of late Cretaceous data, it is reasonable to assume that by the close of the Mesozoic, numerous angiosperm lines had established themselves in Madagascar via either direct land routes through India from the south, or by short distance dispersal across water gaps. What neobotanical evidence therefore (as well as paleobotanical data from elsewhere in Gondwana) points to the presence of Cretaceous Gondwanan relicts in Madagascar? The break-up of Gondwana by the end of the Cretaceous would have resulted in vicariance in basal angiosperm lineages, and thus, relationships today would be manifest at higher taxonomic levels (van Steenis 1984). Modern distributions would be essentially austral and/or cool mesic (pre)montane: South America, extending northward along the Andes into Central America; Africa, especially cooler upland East Africa (with survival into the Miocene and then extinction in South Africa, e.g., Chloranthaceae and Winteraceae (Coetzee & Muller 1984)); Madagascar; and Australo-malesia east of Wallace's line, i.e., Australia, New Caledonia, New Guinea, and New Zealand. The possiblity of "Noah's Ark" rafting on India, and therefore the presence of relicts on the granitic islands of the Seychelles and India/Sri Lanka, as well as then subsequent dispersal into W. Malesia must also be considered (a scenario rejected by Raven & Axelrod 1974). Mid to late Cretaceous/early Tertiary floras from Antarctica, Australia and New Zealand (Birkenmajer & Zastawniak 1989; Burger 1993; Dettman 1989; Dettman & Jarzen 1990; Mildenhall 1980) confirm the notion of a subhumid mesothermal climate across Antarctica, which supported a broad-leaved forest with numerous angiosperm pollen types. Space permits the discussion of only a few examples to illustrate the distribution patterns above.